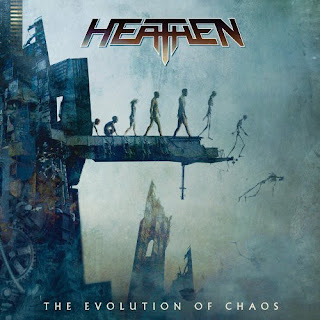 I may not have been introduced to Heathen with their "classic" records, but The Evolution of Chaos does a damn good job of capturing the thrash attitude, both in spirit and aggressiveness. Eras be damned; this record is fine addition to any band's discography, easily standing up to material deemed essential by long time followers. The fans agree, too, because the album effectively has the seal of approval from nearly every metalhead who gave it a listen at its release date. All joking aside, The Evolution of Chaos is what both modern and veteran thrash metal bands should aspire to be. Many acts releasing music in this day and age, however, won't ever touch this record, let alone top it. But that's fine because we have this album to lose ourselves in, immersing ourselves in the world of a reunited and rekindled Heathen. The guitars are vicious, thanks to an absolutely massive production and push the drums to the forefront, creating a wall of relentless sound. While the production certainly sounds the part, it is not without compression and clipping--perhaps the only letdown here. As cliché as it might seem, Heathen have made a convincing formula for modern and veteran thrash metal acts to follow. They obviously fall into the veteran camp because they formed in 1984, but music should not be judged by age or year of creation--meaning both newer and older groups are capable of making great tunes. The formula Heathen have in hand is simple: to create fresh music, rather than blatantly rip-off what's been done before, while holding themselves to a high standard. Sound-wise, my favorite parts of The Evolution of Chaos are the heavy-handed guitar riffs that drive each song. The drumming does that as well, but ends up feeling similar to that extra scoop of ice cream you know you shouldn't eat--but gobble down, anyway. The bass tends to get smothered under the mix, but when given a chance to shine, takes the opportunity and sounds glorious while doing it. In the vocal department, The Evolution of Chaos is a strong effort, with White smoothly tackling everything the music throws at him; although he has a rougher, harsher side when getting nasty is required. Given the usual slow down of older bands, I'm especially surprised at how robust and rugged the album sounds, with each musician gelling together quite nicely. In that way, Heathen's record is nice addition to the already strong roster of veterans with great, new releases. Helloween and Accept would be proud. 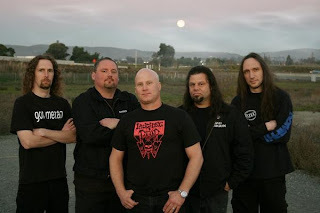 Countless thrash albums are emerging from the woodwork these days, and the majority are rehash of something you know you've heard somewhere before. The Evolution of Chaos manages to avoid that issue all together, breathing fresh air into the subgenre with its unadulterated creativity and energy. It avoids sounding tired, proving Heathen are still relevant within the metal scene, too, and with absolutely no filler. I can seriously recommend it to any metalhead, regardless of subgenre preference. Basically, if you have your head screwed on tightly, and you like guitar riffs, you'll love The Evolution of Chaos.